When you need to be heard you either have a good media outlet to use or you use a good microphone. Both work well in amplifying your voice. We can’t help you with the media outlet, but we can steer you towards the top 10 best wireless microphones in 2019. These microphones do not need wires to have your vice heard above the crowd. They work under most conditions and provide you with freedom of movement and flexibility. A wireless microphone even allows you to go out into the crowd and get them motivated. If you are not sure which wireless microphone made our top 10 best wireless microphones in 2019 list. Just continue to read our review. Then you will know which one to use when you want your voice heard. When you have something important to say, it is wise to use the best equipment possible. Weddings, plays, speeches all need amplification. 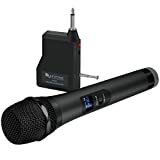 This wireless microphone provides you with 80 feet of range. Just perfect for those smaller venues or family gatherings. The freedom of movement you get makes up for the lack in range. Then you get 20 plugs and pay frequencies to use. If one channel doesn’t work well, just switch to another one and continue your speech. A low battery indicator on both the mike and receiver lets you know when you need to power up or change mics. The easy to hold mic removes any wires that can be tripped over for an accident-free, we hope, event. This unit works with guitar amps and DJ mixers. Batteries are not included. Some drawbacks include contact pints not working well and may be loose. The circuit board floats inside the microphone and there are some volume control issues. This wireless microphone set works with UHF to bring you top quality sound between the 653 – 663 MHz frequencies. It supports 80 channels with little pops, interference, and fewer dropouts. A digital display on both the microphone and receiver lets you sync up channels without any confusion. The LCD display also keeps an eye on your battery life. Made from metal you know that both units will be durable and strong. You get ¼ and 1/8-inch adaptors in case you need them. Plus, this set will work up to 250 feet away. A headset mic, a lapel mic, a body pack and 4 batteries are also included in this set. You will have a mic for every situation. One drawback is that it may not be compatible with DJ mixers. A major drawback is that you cannot get replacement handheld mics if the one in the pack fails. Also, some mics cut in and out. 2 wireless handheld microphones come in this set and they both use UHF 80 channels to broadcast your message or song. 40 channels for each mic. Also, you can hook up 5 receivers and 10 mics to the same frequency and host a roundtable or other multi-voice event. Once charged up, the microphones will give you about 16 hours of use and reach a range of about 240 feet. The range depends on the type of obstacles in their way. The built-in digital LCD display lets you know which channel you are all on and how much time you have left before the battery expires. Set up and synchronization are simple and shouldn’t take to long to do. Some drawbacks are, a little background noise or feedback issue when singing or speaking into the mics. Then there is an output issue with one the receiver. Batteries do not last. Using the 174~216MHz frequency range you get 2 channels of wireless microphone fun. Then its design keeps the signal strong to over ride any interference that may come your way. Individual volume controls make sure you can balance out both users to produce clear sound for the audience. An LED indicator light keeps you informed of the signal strength and each microphone has its own on and off switch. A ¼” connection is all you need to plug this unit into an amplifier, mixer or speaker. Also, both wireless microphones have their own antenna. This makes signal strength a lot better. The system uses the VHF transmission as it keeps distortion levels down. You should be able to get about 50 feet +/- range capability. One drawback is you cannot add on to this unit. It only supports 2 mics and 1 receiver. They are not good with minor obstacle sin the way. Then their range may not be as good as people want. 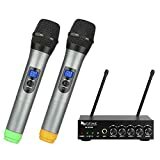 With 2 mics and 8 frequencies, you should be able to have a lot of fun with this wireless microphone set. Bright green LCD digital displays allows you to synch channels with ease. They also keep track of the battery life in each microphone. The UHF 573.0 – 597.8 MHz system provides up to 160 feet of range without obstacles getting in the way. Also, the system works hard to keep noise, distortion and other microphone issues to a minimum. Each mic has its own antenna, power switch, and signal indicator lights. Just make sure to keep an eye on the details as you use these mics. Independent volume controls give you some measure of control over vocal balance. UHF wireless microphone systems seem to experience less interference than VHF systems. The signal may be more reliable as well. When you purchase this set, you get up to 80 feet of range, just watch out for obstructions. There is an overall mic volume level control and individual microphone volume controls. Plus, the digital display reminds you of what channel you are using. An attractive feature is the echo function. You can play with your voice to get the right sound with that function. 2 wireless microphones with independent on a doff switches and battery life indicators are included in this set. Make sure to read the instruction manual to learn how to operate this set correctly. A minor drawback is that these mics may not last that long. Then the system dropped one channel for no reason. Finally, the power cord is extremely short. When you really need to be good, this UHF system provides you with 2 channels to work with 2 Microphones. That is 100 per channel. Plus, you can add on 15 more receivers and 30mics to make sure you have the sound coverage you need. The receiver measures 19 x 4 x 1 inches and has individual digital displays, antennas, volume control and more for each mic. The mics also have the LCD display screen s you won’t be confused about which channel you are on. Using the UHF 520MHz – 560MHz frequencies, you get over 300 feet of range. More than enough to handle your amplification needs. Also, this system comes with automatic frequency scanning to make sure you get the best available channel. One drawback is found in the cheaper construction materials used in this set. Another drawback is that it is very difficult to set the gain function. A third drawback is that the antenna connections may be loose. 2 wireless microphones double your fun. Especially when each microphone has its own antenna, volume control and other technological upgrades. The receiver and mics come with digital displays so synching channels and volume is not that difficult. Plus, you get up to 8 interference free channels on the UHF 653 – 663 MHz frequency band. That system allows you to reach up to about 260 feet before you are out of range. Where you can use these wireless mics is limited by only your imagination. Also, you can add in other mics to the system if you need to. 4 AA batteries bring the power you need for your afternoon or evening of fun. One major drawback which can be a common issue is that some inferior microphones or receivers slip past inspectors and make it out onto the open market. It is the luck of the draw if you get one of those. This wireless microphone work with a mini receiver. You do not need a lot of space to use this system. Plus, it works on the UHF frequency, so you get 25 channels to choose from. The receiver is compatible with amplifiers, mixers and more with its 1/4” jack. 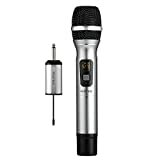 A power button on the mic keeps you in full voice and a digital display lets you know what channel you are using. Distortion and feedback are things of the past with this set up. Also, it is a plug and pay unit which uses 2 Aa batteries for its power. Just one thing, while you can have several mics and receivers at the same function, one mic works with one receiver only. One drawback is that the mic picks up a lot of static sound that can’t be removed. Also, movement noises are heard when you move your hand that is holding the mic. Some interference does come into play as well. The Quartz crystal oscillation technology helps stabilize the sound in these wireless microphones. It also helps stabilize the signal and transmission to the receiver. Using the UHF 530-580 MHz frequencies, you get up to 200 channels to play with and use. The receiver has digital displays, antennas, and volume controls for each individual mic. Plus, it has automatic scan and sync mode at the push of a button. A simple rocker on and off switch keeps the power on or cuts it off. With this wireless microphone set you also get up 300 feet of range. Just make sure there are few obstructions in the way. As always there are a few drawbacks to this wireless system. First, there is no mute button to cut the sound when you need to. Just an on and off switch. Then the instruction manual may be a bit difficult to comprehend. And finally, some quality control issues with mics not working. The obvious reason is that wires get in the way of what you are trying to do. Which system works best for you depends on your activities. Wireless microphones od make it a lot easier to handle DJ wrk, masters of ceremonies work and other fine public engagements. They are also good when you have to give a speech or lecture. 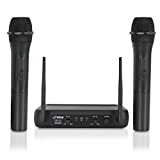 You can move about without worry One of the top 10 best wireless microphones in 2019 is the right tool for all of these activities. They are also the right tool when you want your voice heard. They have the power, they have the volume and they have the channels so you cannot be muted out.